Gotta love how Boyce, a traitor to the US who provided secrets to the Soviet Union, bashes a man who for no financial gain decided to bring to attention abuses of government power to the American public. Why is such a man working for CNN? ....and Snowden thinks Russia is more noble and morally upright than America. This guy is living in a fool's paradise and will soon learn the hard way that he is no more than a tool to Russia and at the end of the day will be more restricted in Russia than he ever was in the US. The Russians will be watching him like a hawk, listening to his every conversation. 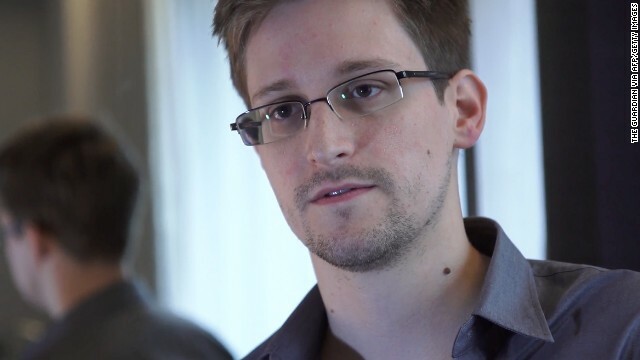 Isn't it ironic the very thing Snowden claims he did here because spying for our safety was so called "wrong" will be the very thing Russia will be doing to him. I hope he makes peace with what he has done because he can forget life ever being normal for him again. He has opened up the gates of hell for himself and his family. Mr. Wise guy!! Explain to me Laverne, just how can the Russians or anyone else for that matter be less noble than the right-wing thugs in Washington these days? Just look at how we're slaughtering people day after day with out ungodly drones, for instance. And what about our obscene take over of Iraq back in 2003? Need I say more? Now that's what I call a Left Wing Thug. As for the Russians, they don't bother with expensive drones when a good old fashioned carpet bombing will do. Boyce guilty, Snowden guilty. Brdaley guilty. You compromised your positions and your loyalties. Your word as a man has little value. Your competencies as intel analysts, intel workers, trusted with senstive information, trusted with adult concepts- all broken! You have littered the information highway with your trash. The greater news: American Intel agencies domestic and abroad, no longer have a global blank check for its intelligence gathering. Most importantly it has lost the confidence of lower class, middle class, and limited upper class americans. It (the govt and intel agencies) cant even hold itself accountable for its own actions, like wall street, they have become rogue gamblers, putting all at risk for a short joy ride on leveragble data. He thinks there is less surveillance and more civil liberties in Russia?? I'm very surprised that Christopher Boyce finally got out of prison where he should never have been sent in the first place. His imprisonment was just one more act of "political" correctness. Australia was one of our most loyal allies so why did we interfere in their political affairs? This was wrong as one can expect this kind of action toward our so-called "enemies", but not our any of our allies. I'm sorry to say, Christopher, any reforms on this matter are virtually nonexistent and were long before the Snowden leaks. This obscene surveillance will only continue into the foreseeable future. Like you, I resent the fact that we interfered illegally in Australia's internal affairs back in the 1970's just because Prime Minister Gough Whitlam followed policies our own government didn't like.